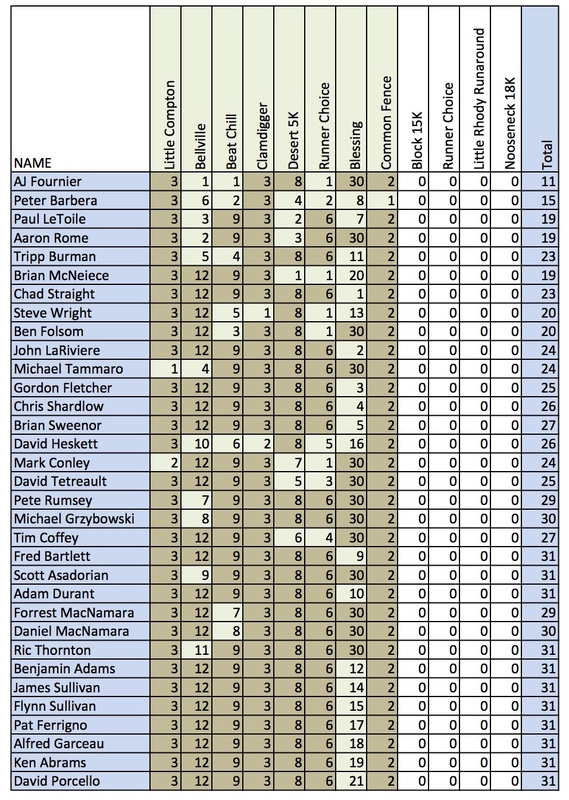 Current standings in the Club Race Series are below, updated to include races through August. September race is the Block Island 15K on Saturday, September 10, and the October race is runner’s choice. 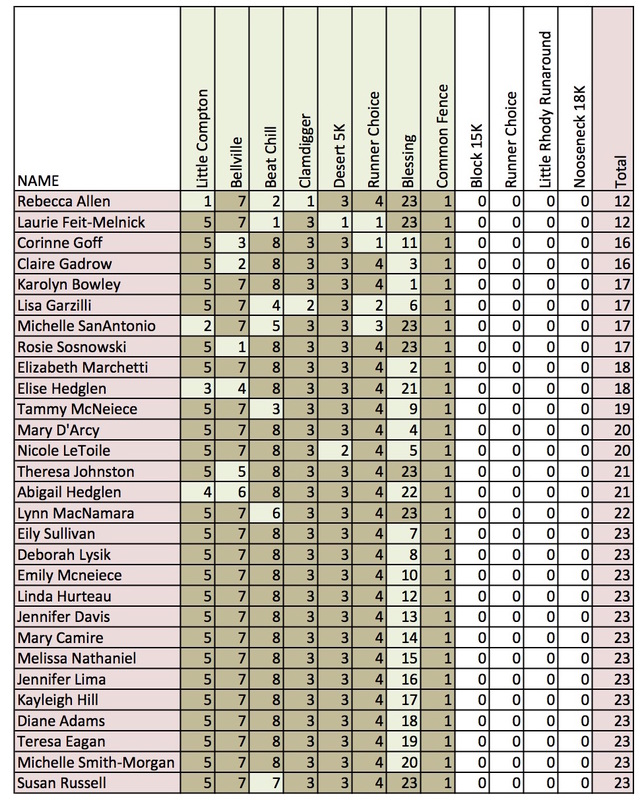 I have been negligent in posting the monthly race report here, but Mary D’Arcy has not been negligent in sending it out via the email list, so hopefully you’re all receiving it. If for some reason you’re not, please contact me at msanantonio4@yahoo.com, and I’ll be sure to add you to the list. Great racing by everyone in the club this summer, and I love reading this report every month and seeing what you’ve all been up to. I’ve had a string of injury issues so haven’t done a lot of racing the past few months, but hope to get my name back in the report starting this month! Here’s hoping for a beautiful September, with cool nights and warm days, and the beginning of more comfortable, drier air that makes for perfect running weather. 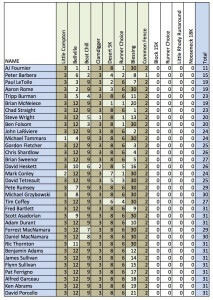 At long last here are results from August. If you think these results are impressive just wait – temperatures are about to drop, and lower temps=faster times! A great way to test this theory out is by running the upcoming Gansett Half Marathon on October 23rd, but if you can’t wait that long to race, consider the next race in our Club Series, the Run Around the Block on 9/10 http://www.active.com/block-island-ri/running/distance-running-races/41st-annual-15k-run-around-the-block-2016 The Block + our favorite sport – what’s not to love!! 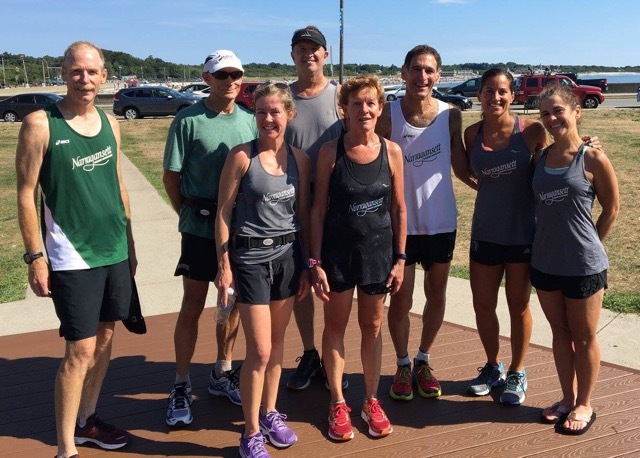 Thanks to all who turned out for the Gansett Half Course Preview Run last weekend (see picture below). Mark your calendars for the remaining two Course Preview Runs: 9/18 and 10/16 and stay tuned for details. And finally, this Tuesday (like, tomorrow) come celebrate a great summer of running at the annual Running Club Summer Party at the Wickford Yacht Club at 6:30pm. Thanks, Mike Tammaro, for organizing!! Enjoy the results and see you out on the roads!